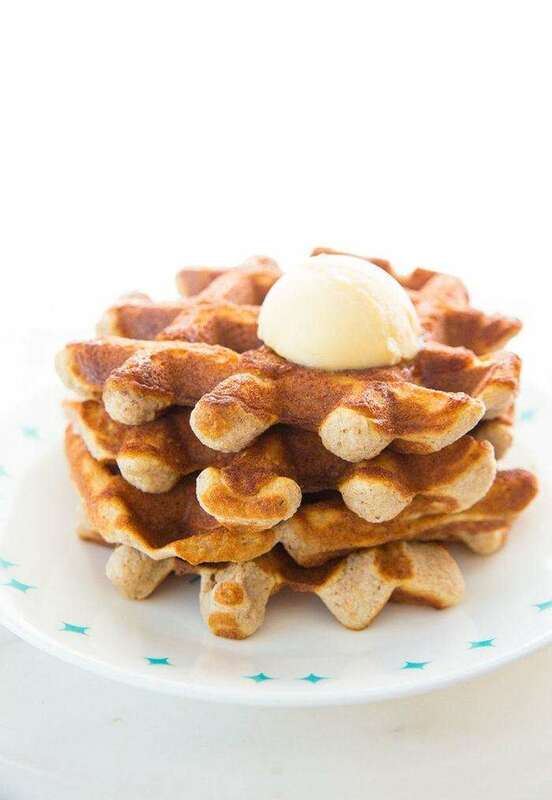 Low carb Keto waffles doesn’t necessarily mean dense and thick waffles. Yes, I am not going to pretend that the texture of these waffles is the same as normal flour ones, let’s not kid ourselves here. However these waffles are a good texture, they are not doorstop thick and they were an enjoyable breakfast. The secret is also the spices – there is nothing like mixing together those pumpkin pie spices to bring life to a meal. We ate them with butter on top, but if you have a low carb syrup that you want to use, then that would be awesome on these! I just don’t have sugar-free syrups hanging around the house, but I do know that they are out there. The NET carbs on these are 2 per waffle, which is a really low carb way to start your day! Add on butter for extra fat if needed to suit your macros. Make sure to beat those egg whites! While you do mix them in and you DO lose fluffiness, that’s what the baking soda and powder are also there for. You are hedging your bets and using egg whites for added leavening and lift as well. You can choose your choice of sweetener as this is a HIGHLY debated topic in the Keto community. Don’t bother leaving a comment telling me how Splenda is a bad choice or whatever when it comes to Keto – I have no interest in debating the merits of the different fake sugars. 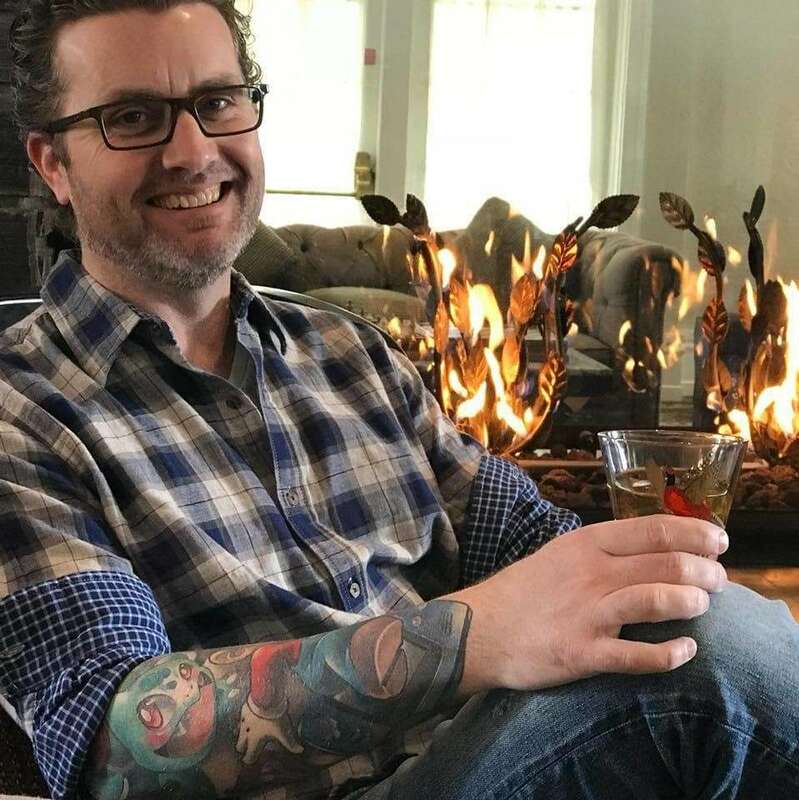 You do you – and what works for you on Keto! Try this Keto Thick Maple Syrup recipe if you are looking for a homemade Keto syrup. Want to BUY syrup? This maple flavoured sugar free syrup has amazing reviews! 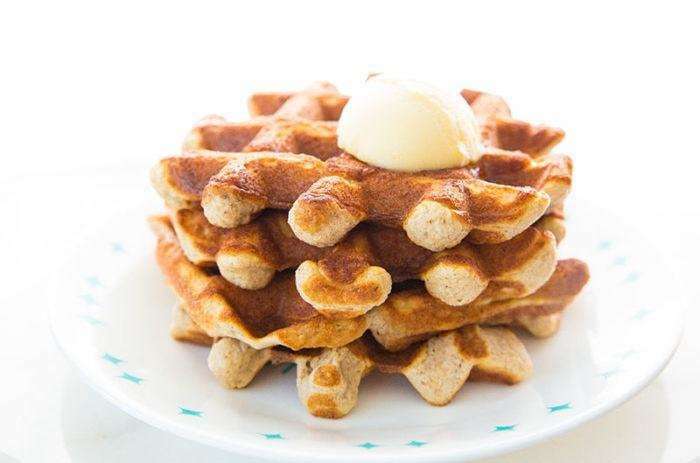 These Crispy Sweet Cinnamon Keto Waffles are perfect for waffles lovers that are on a low carb diet! They are sweet so we topped them with some salted butter and they were heavenly! In a medium bowl, whisk together all of the dry ingredients in a bowl. Set aside. Divide the eggs and place the yolks in one bowl and the whites into a medium sized bowl ( large enough to use a hand mixer to beat them in). Mix together the egg yolks, vanilla and butter and set aside. Beat the egg whites until as light and fluffy as they can get ( the whites should form peaks when you life up the beaters). Mix the egg yolks mixture into the dry ingredients. ( it will be a dry mixture.) Then proceed to add in the eggs whites, slowly mixing them in until the mixture is fully combined. You will lose some lift, don't worry, just combine them in until the mixture is smooth. Preheat your waffle iron and make 4 waffles. Serve with butter and a low sugar syrup if desired. That’s awesome thanks for the comment! I’m glad you love them so much! This recipe is amazing! Thank you for sharing. Low carb waffles, I made pancakes. I have a nut allergy what could I use in place of the Almond flour?